New comics are released today (in the States at least; we have to wait until Thursday in the UK, dust clouds and airspace permitting - yes, it's started up again!!) Here's a brief look at our expectations for the books we're picking up this week. Stewart R: Welcome to the Brightest Day, Earth people! Oh yes, here we go. 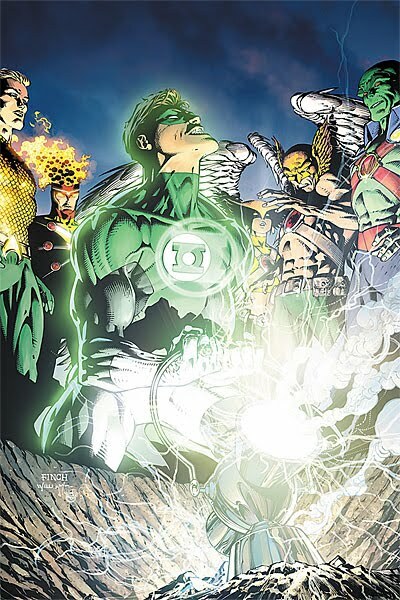 Despite the rather mediocre ending to Blackest Night I'm actually highly optimistic about the prospects of Brightest Day #1 and the other 25 issues ahead of us through the course 2010 and 2011. Geoff Johns and Peter J. Tomasi working together to weave this story will hopefully help a sense of focus reign over this series as things could potentially go wrong with such a drawn out run. The use of four contributing artists is also something I'm interested to see in action, especially as issues #1 and #2 are 40 pages long, giving the art team a healthy slice of the pie each. Later issues drop back down to the standard 32 page format so as not to spoil us too much and that's where an ever changing roster of penciller's could enhance or ruin the feeling of continuity. It'll also be interesting to see how much of this Brightest Day story Johns and Tomasi 'farm out' to all of the other titles involved, or on the periphery of, this series. Early whisperings and press releases suggest no less than 8 other titles will be affected by the goings-on in this book and I just hope that we readers are not forced to make too many tough decisions. The Blackest Night event has safely secured Green Lantern and Green Lantern Corps a couple of places on my pull-list and as it creaks under its own size already I could do without having to pick up many more 'maybe' or sampler titles. Of course there are other efforts from DC that have made it onto my radar in the past year and it would almost be rude to consider leaving Batman and Robin #12 on the shelves of Paradox this week. 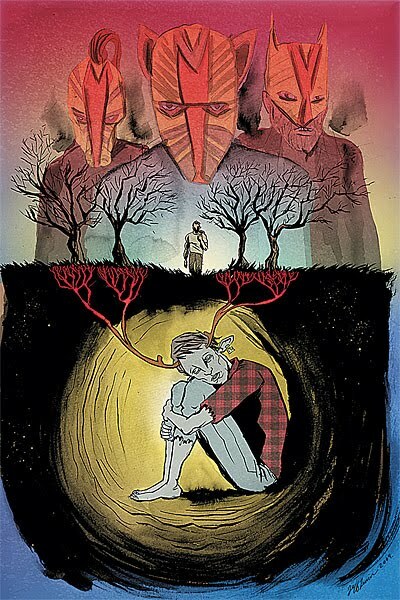 Grant Morrison has been really ramping up the mystery behind Talia Al Ghul's plans, Oberon Sexton's true identity (possibly spoiled for me it must be said in researching for this week's 'Incoming...', dear readers) and the potential clues and riddles left behind by Bruce in days long passed. Andy Clarke's art style has been more up my street compared to Cameron Stewart's work on the last arc and I look forward to what he brings to the table for his last issue for now. Certainly one comic where the artistic duties are not up for grabs will be Sweet Tooth #9 by Jeff Lemire. This is a book that you should have a least thumbed through by now as it really is a terrific alternative to the superhero and crime-based titles that make up the majority of the bestselling printed offerings today. Lemire has done a fantastic job of showing us that whatever wonderful or not-so-wonderful a world you manage to create, a comic will not work unless you populate that world with characters of interest and variety. In Sweet Tooth he's managed to bring two characters to the page that make you want to learn more about the world in which they try to live. Another writer/artist crafting out landscapes and personalities is James Stokoe over at Image from whence struts Orc Stain #3 in its bizarre glory this week. Seriously, I have never seen a comic pencilled, inked and coloured in this way before and what Stokoe is doing with his Orc-based world is terrific fun. This week One-Eye is on the run following the nasty bit of business he had to conduct in Skrubtown last time out what with his partner's double-crossing and a necessary bit of comeuppance. Hold on to your gronches guys, for things are about to get a little hectic! This year's Pilot Season from Top Cow has been something of a muted affair in this reviewer's opinion with a few offerings dotted around here and there and little really being touted, advertised and reviewed as being worth looking at. It's a shame really as Robert Kirkman is a heck of a writer but I've actually got a good feeling about Pilot Season: Stealth #1 which hits the stands Stateside tomorrow. The story centres on Todd Carey, newly divorced with a daughter failing at school and his father diagnosed with Alzheimer's. Yep, things sound like they're getting on top of Todd but wait, here's the kicker, Todd's aging and ailing father is masked vigilante Stealth and has been for years. It's a neat twist that seems to share a slight similarity with Kirkman's great Max title, Destroyer. Only a one-shot but I'm definitely intrigued by the premise. For those of you who do enjoy the odd X-Men comic but maybe haven't been sucked into the Second Coming event I must say that it is begrudgingly brilliant so far. I do always question why Marvel bother spreading the chapters out amongst the various X-titles rather than just suspending them all and making do with an 'Event Book' all by itself for a few months, if for no other reason than to help us poor readers organize our longboxes with some sense of logic! That, of course, does not detract from the quality of the story therein and I have been hugely impressed by all involved so far. Matt Fraction's Uncanny X-Men #524 is the place to go for Chapter 6 where the X-Men must deal with the tragic events that transpired in X-Force #26 last week. Can you sense that? That strange sort of static, humming-type feeling that you might just be getting on the back of your neck or in your ear? Oh, it's nothing really, just me sat here shaking, nay, vibrating in my chair with sheer excitement at the prospect of another comic containing Chris Bachalo's sumptuous artwork. The man sits atop my list of favourite comic book artists ever and this week sees his return to the life and hard times of Peter Parker in Amazing Spider-Man #630. 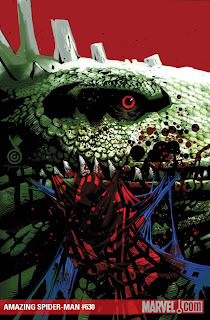 He's dealt with Hammerhead, Mr Negative and Venom in previous webhead stories; this time he gets his teeth into The Lizard and I'm going to take great pleasure in seeing what he delivers. Zeb Wells pens the next unfortunate chapter of Curt Connors' life but I'm now getting increasingly confused with what is and what isn't part of 'The Gauntlet' storyline so c'mon Marvel, sort it out and let us know what's happening! Dagnabbit!! Because of the stupid Bank Holiday - not a pleasant one for me as I was ill! 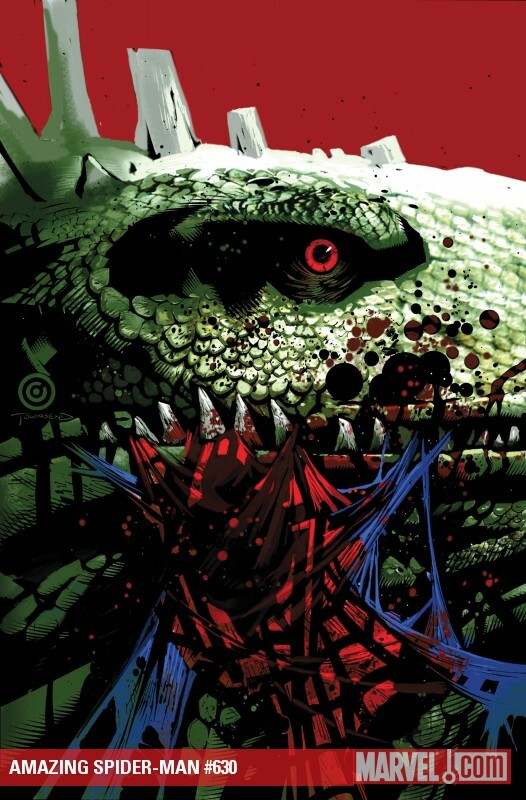 - the delivery to the UK is a day later than usual so now I'll have to wait until Saturday for some Chris Bachalo magic!